From left to right: Commissioner Joseph Perry, Peter Tischner, Commissioner, Paul Tonna and Commissioner Ciro DePalo. 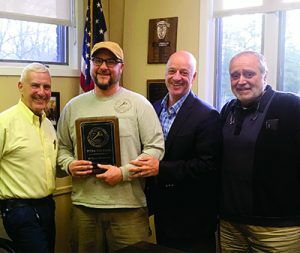 The South Huntington Water District recently recognized Maintenance Mechanic Peter Tischner for his contributions to the District during his 10 years of service. Peter’s daily responsibilities revolve around the maintenance and repair of the District’s infrastructure, including the distribution and production facilities throughout our 22 square miles. Being a certified Water Treatment Plant Operator and Distribution System Operator, Peter’s responsibilities include preventive maintenance and repair of water mains in our 271-mile-long network, maintenance of over 1,700 fire hydrants, and replacement of water meters. Peter also participates in the District’s weekend rotation schedule, testing and recording well water production data. The South Huntington Water District is grateful for your effort, dedication and sense of teamwork. Thank you, Peter.